No more waxing or shaving – This is the latest technology in permanent hair reduction. Ellipse is an intense pulsed light (IPL) treatment, virtually pain free & completely safe. 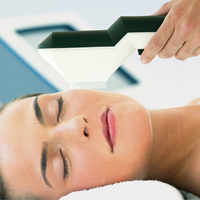 All areas of the face & body can be treated & excellent results can be seen immediately. Ellipse IPL needs to be taken as a series of treatments to be effective. The number of treatments required depends on the areas treated & the type of hair. Intially a free consultation & patch test will be carried out. We offer discounts for multiple sessions when paid in advance. Ellipse Intense Pulsed Light hair removal is a permanent hair reduction technique & is clinically proven to be safe & effective. Try before you buy - If you would like to know more about this fantastic life-changing treatment please book for your free, no obligation consultation & we will carry out a small test patch on the area.